Saturday 28 September 2013, Senate House. If you are a new student on the Diploma in Law, Diploma in the Common Law or the LLB, the prospect of beginning such an intensive course via distance learning may prove daunting as you embark on your first year. 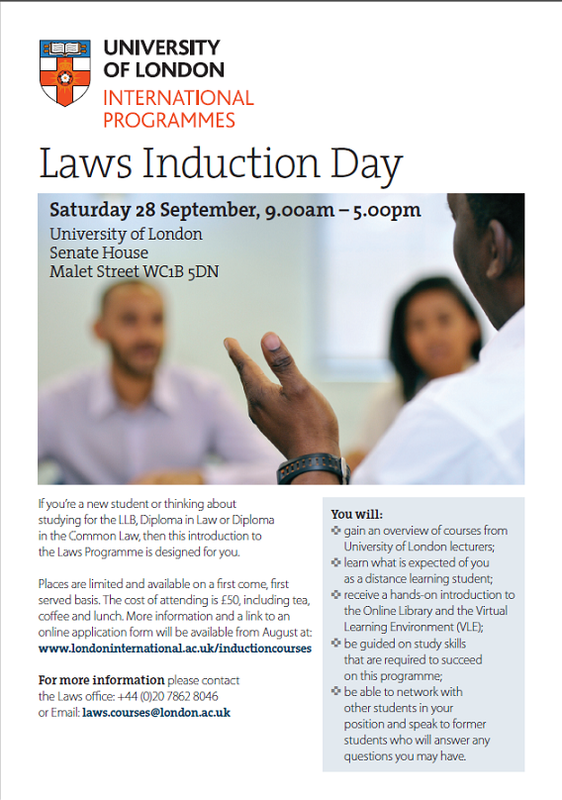 The Laws Induction Day is designed purely for you. Held at Senate House in London, this provides an opportunity for you to speak to University of London academics and staff as well as former and current students, who can put you at ease on what you can expect of the degree, and more so, what is expected of you! You will be able to explore the Online Library and Virtual Learning Environment (two key areas that you will need to familiarise yourself with), as well as attend two Introductory lectures in CLRI and Criminal Law. For more information about the day, please see our website.